The new MacBook Pro to be announced at WWDC 2012 tomorrow may not sport a redesigned Air-like enclosure. According to these photos—posted to Chinese forum WeiPhone—they will have the same industrial design of the old models, down to the same screw placement. Chinese forum WeiPhone usually has solid information and these photos seem real. They show different components in a similarly shaped motherboard that has the exact same holes as the current one has. This may indicate that the exterior aluminum unibody design would remain exactly the same. 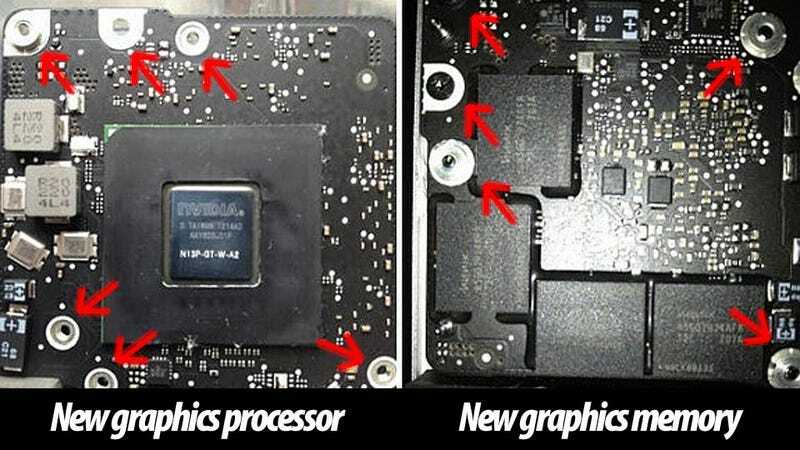 According to the poster, the 15-inch MacBook Pro will have 2.3GHz, 2.5GHz or 2.7GHz Ivy Bridge processors. The images also confirm that they new machines will use a Nvidia's GeForce GT 650M graphics card with 1GB GDDR5 graphics memory. There's absolutely no mention of Retina Display. However, don't start to cry yet. There may be a top of the line MacBook Pro just like the ones everyone is hoping for, one with a solid state drive, a 15-inch Retina Display and a design similar to the MacBook Air. Who knows, maybe there will be new MacBook Pros looking just the same and a new MacBook Air 15-inch. At least, that's what I hope.